-U$C is currently suspending itself from any postseason play due to iffy recruiting practices that occurred in past years. Make sure to ask the Trojan players how much they’re paid. –Stan Holt created some controversy when USC played at Oregon a few weeks ago. He received a technical foul for cussing at the refs which ignited an Oregon run that led to USC losing the game. Stan was fired initially and then allowed back which means we’ll probably get to make fun of him. Should give us something fun to talk about. –#43 F Kasey Cunningham (Jr.) goes by the Facebook name “Paul-Kasey Sugafoot Cunningham” and says he’s a combination of Isaac Hayes and Jaleel White. You be the judge. –#35 G Daniel Munoz (Fr.) can be reached at [edited for relevance]. His bio says he will “add depth at the point guard position.” In other words, we probably won’t see him play. –#4 F Leonard Washington (So.) goes by the Facebook profile name “Leonard Boogie Man Washington” so it’s safe to assume his nickname is Boogie Man. He enjoys riding horses. *Editor’s note: Two important things here. 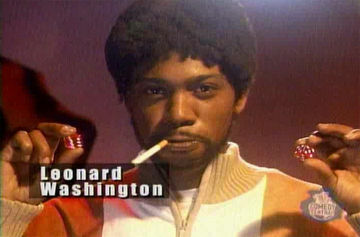 One, Leonard Washington is also the name of this character from Chappelle’s Show, who most notably appeared in the “Trading Spouses” episode (memorable quote: “Damn! Now I heard of trimming the hedges, but you done scorched the earth!”). And two, some of you might remember when Washington was ejected from a non-conference game last season for punching Oklahoma’s Blake Griffin in the testicles. You can watch a low-quality version of the video here. –#0 G Marcus Johnson (Sr.) just had his 23rd birthday on February 13th so let’s make sure and wish him a happy belated birthday. During the 2007-2008 season he played in one exhibition game for UConn for a total of six minutes, scoring three points in a defeat of Assumption College, but in the process lost a year of eligibility. His time was limited in the Assumption game and caused him to miss UConn’s other exhibition game due to an injured right elbow. He was later given an injury waiver for the season, then transferred to USC and began taking classes in the 2008 spring semester. –#34 G Korri Ennis (So.) just turned 22 on February 11th. His middle name is Demitrius. Korri transferred from Florida A&M to USC and did not go out for the basketball team. He spent the season focusing on his studies and playing on the scout team, which practiced with the USC women’s team. His cousin played in the WNBA. *Editor’s note: There are just so many different directions you can take this. Starting with the fact that Korri might very well be the world’s oldest sophomore. –#1 F Alex Stepheson (Jr.) says his favorite NBA athlete is Amare Stoudemire. He also claims his greatest achievement outside of sports was winning a spelling bee as a sixth grader. Let’s challenge him with a couple choice spelling words. –#3 G James Dunleavy (So.) is the son of Mike Dunleavy Sr., and brother of Mike Dunleavy Jr.
Mike Sr. was the GM and head coach of the LA Clippers until he was recently fired. Mike Jr. plays for the Indiana Pacers and is a former Duke Blue Devil. James has only played in one game this season. –#5 F Nikola Vucevic (So.) was born in Switzerland and raised in Belgium. Both his parents played professional basketball in Europe. We should probably ask him about the waffles in his home land. –#44 G Mike Gerrity (Sr.) played great defense against the Huskies last month so let’s be sure to get in his head. His fiance’s name is Jessi. He must be lying about his age because he looks at least 34. *Editor’s note: During the 2006-2007 season, Gerrity, then a sophomore at Pepperdine, appeared in one game with the Waves before opting to transfer. That one game came in a loss to Washington at Hec Edmundson Pavilion in which Gerrity logged two minutes and had zero points. On another note, USC is Gerrity’s third school. Prior to becoming a Trojan, the 6’1″ point guard spent a year at UNC-Charlotte. –#10 G Tyler Sugiyama (Fr.) worked in the U.S. House of Representatives in Washington, D.C. during the summer of 2008. Can you say “random”? This is a pretty weak edition of the Dirt I must say. Kasey Cunningham is a boss. He was Demar Derozan’s influence for his sick off the side of the backboard dunk during the Dunk Contest last weekend. The real boss would be the guy that won it… not Derozan. Nate, from the Dub. You really wanted to bring that up? Nothing on #15 Percy Miller (aka Lil’ Romeo)? Last year the Dawg Pack blew up pictures of him. He might get in there in the last few minutes if the Huskies can do what they do at home. The guy is loaded but still received an athletic scholarship as far as I know, good thing he’s taking away from the less fortunate. I read a story someone posted about a month back stating that he had been dismissed from the team and he hasn’t played since the beginning of September. If anyone knows otherwise or if the story I read was wrong just let me know. We’ll get that edited. I would love more than anything for him to make his return. He loved the attention he was getting from us. I’d say that this edition of the Dirt is understandably weak. While the players can’t afford to look past this game, the Dawg Pack can. And I have a feeling they’ll be saving most of their energy and creativity for the ESPN Gameday crew on Saturday. 12 straight hours of craziness. Good luck with that. Drink lots of Red Bull. I tried looking online for something about Lil’ Romeo and this was the only thing that I found. http://latimesblogs.latimes.com/sports_blog/2010/01/usc-basketball-percy-little-romeo-miller-i-didnt-quit-the-team.html So who knows which one is right? Hmm… well I guess we’ll see when the game comes. Also, sometimes we just don’t have a lot to work with with some teams. It was the same with USC last year. Some teams just have gold mines of info while others are more careful about what they say and do so we just work with what we have. Earlier this year, he was ineligible. That’s greater propaganda than anything we’ve ever pumped out on this site. Not much you can say but wow. How do you make fun of someone when Jessica Alba is quoted as saying “He’s every woman’s dream man”? Jessica F-ING Alba! I guess in this case, insulting his basketball skills is probably preferable. It’s a good thing not too many other college basketball players have PR staff, otherwise the Dawgpack Dirt would be a lot less interesting.